We had a day of eating out, asparagus and fun! I don't take a lot of time in my life for just my friends, and when I have a day of nothing but friends and fellowship, I forget HOW MUCH I LOVE MY PEEPS! New friends and old friends. I treasure these people and as we grow as friends, we begin the joy of watching our children become friends. 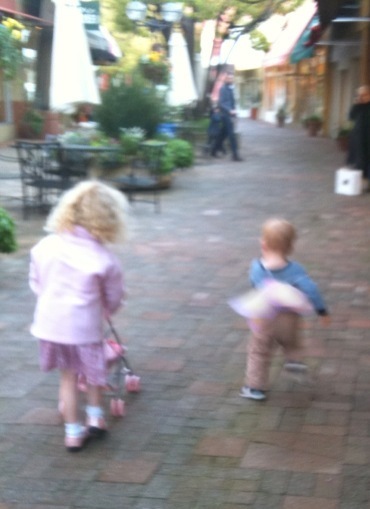 And yes, that is my son running around wearing fairy wings. And yes, I am fine with it! Brought to you by Sesame Street! The happymommy crew is heading out of town for Spring Break. We have people watching the house, the dog and the cat. So no need to try to rob us. We are covered! I may try to blog from the road, but probably not. Enjoy your weekend and remember.... Easter. I am. Thanks Cousin Chase for reminding me of this and thank you Johnny Cash and The Carter Family! Daycare and making new friends. The guy is a natural! Johnny Cash cannot be all bad!